I'm finally catching up on my book reviews! Yay! I've read some incredible titles over the last couple of months and I'm super psyched to share them with you, as well as the internet in general. Haha! 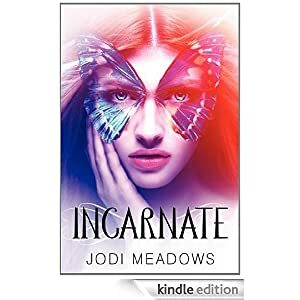 This week, I'm reviewing the Incarnate trilogy, written by Jodi Meadows. Before I even get into my review, can we please talk about these covers? In the history of all covers, these three are absolutely some of the prettiest I've ever seen. I can't even pick which one I love the most because they're each so freaking gorgeous. But the craziest part is that the story is even better than the covers, guys and gals. And yes, I know that may be hard to believe but it's true. I read these books as quickly as I could manage, and it was a glorious week and a half. If I had to come up with a three word description for this series it would be: a quiet storm. The plot doesn't scream at you, it whispers, sending tingles down your spine. But that's not to say that you aren't on the edge of your seat, because I sure as heck was. To put it another way, you know how if someone's speaking quietly in a loud room, you have to lean towards them in order to hear what they're saying? That's what the Incarnate trilogy is like. 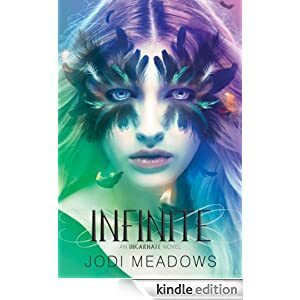 The beauty of this trilogy--the element that sets it apart from other YA fantasies--stems from its thoughtful and understated tone and and I was hooked from the first page of INCARNATE, through ASUNDER, and was then forced to burn through the incredible INFINITE because I couldn't wait to see how it all turned out. Ugh, guys, these books are just so freaking good that I can't even handle it!! Haha! So freaking cool, right? I mean, how did Ms. Meadows even come up with that? I won't share the rest of the back jacket descriptions, because then this review would be hella long and would be a little spoiler-y, but if you're at all piqued by INCARNATE then you may as well just buy the whole series because I can pretty much guarantee that you'll read all three. Probably in as many days, if you can fake sick to get off work. Haha! Ana is an incredibly deep, thoughtful girl who, just like other teenagers, doesn't always make the best decisions but it doesn't matter because I cheered from her from start to finish. She's noble, serious, playful, and insightful, and she's become one of my favourite YA heroines. One of the elements I loved most about this series is how Ms. Meadows dealt with the hundreds-of-years-age-difference between Ana and Sam. I've always felt a bit icky rooting for relationships when they involve a teenager whose love interest has been around for centuries and the Incarnate trilogy addresses it right on. As in, it's literally a discussion in the book between Ana and Sam. That level of awareness made me love these books even more, and with the reasonings given, I was able to invest in the relationship and it added greatly to my overall enjoyment. 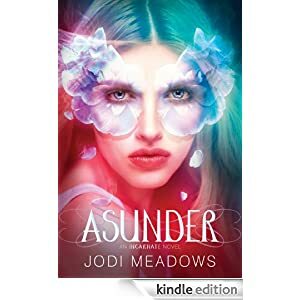 So basically, what I'm saying is that if you like YA fantasy or other world-building books or romances in general, you're going to want to give this trilogy a try. Like, immediately. If nothing else, you'll have the prettiest covers ever to stare at, but like I said at the beginning of this review, if you think the covers are gorgeous, you're going to fall head-over-heels for the writing. Definitely sounds intriguing! A bit mysterious and a bit love story. Incarnate is on my shelves, ready for the reading...and I can't wait! This series sounds soooo good!